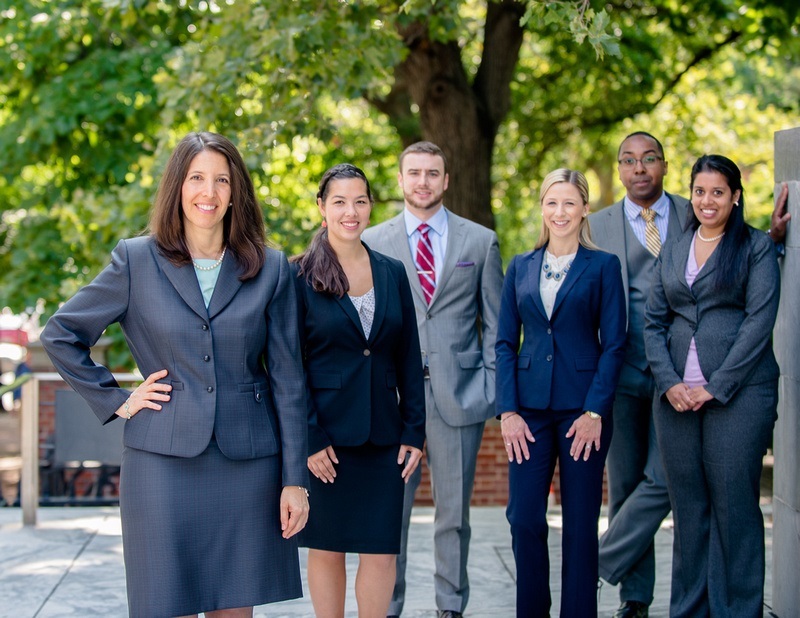 Firm President, Sheryl L. Axelrod, standing before a number of the attorneys she mentors — from left to right: Melissa Pang, Dan Oberdick, Axelrod Firm attorney Vanessa Snyder, Damian Sammons, and Neelima Vanguri. I volunteer quite a bit of time to improving the legal profession, and have since I was a young lawyer. I served three years on the Executive Committee of the Young Lawyers Division of the Bar Association (the YLD), an elected, volunteer post. I primarily dedicated my time to children including by co-chairing the Michael K. Smith Oratorical Contest for students in grades 4 through 8, and the Doctor and Lawyer in the Classroom events for young people. At the Oratorical Contest, my fellow lawyers and I sat as judges, listening to young students deliver arguments on mock appellate issues. It gave the students the chance to begin to develop oral advocacy skills, have fun answering questions, and get positive feedback. Those of us who volunteered as judges had a wonderful time. Many lawyers came back to participate in the event year after year. Doctor and Lawyer in the Classroom events, where members from the two professions talked to students about their careers, were great, too. The students would invariably pepper us with questions, full of enthusiasm and curiosity about their futures. It was a joy spending time with them. In the Spring of 2010, the Chancellor of the Philadelphia Bar Association appointed me to two posts: (1) to a three-year term on the Commission on Judicial Selection’s Investigative Division; and (2) to Co-Chair the Bar’s Law Practice Management Committee. Those of us on the Investigative Division vet the people seeking to be elected as judges in Pennsylvania. Our investigations begin with a review of the candidates’ written submissions. From there, we go to the candidates’ offices, meet with them, speak with their references, and in every case, identify and talk to a minimum of four additional people whose names the candidate did not supply. We use defined standards to assess each candidate including the candidate’s legal ability, experience, integrity, temperament, community involvement, and judgment. The Investigative Division is an arm of the Commission on Judicial Selection and Retention, an independent, non-partisan body. The Investigative Division, like the entire Commission, includes lawyers and non-lawyers alike. Commission members are community leaders, officials including the Chief Public Defender, the City Solicitor, the President Judges of the Municipal and Common Pleas Courts, and representatives of minority legal groups and sections of the Bar. It is an honor to serve on the Investigative Division, to lead investigative teams, and to report our findings to the Commission. What is perhaps most satisfying is the great trust the public has demonstrated in the Commission’s work. Individuals who are not recommended by the Commission generally do not get elected. Harper, James, and I approached the LPMC with the same vigor we brought to our practices. Each of us had started a law firm and seized upon the economic climate to grow our business. We did so by viewing the economic downturn not as an obstacle, but as an opportunity. It presented new challenges and if we could meet them, we could leapfrog ahead. We figured we could look at Scott’s directive for us in the same way. Reinvigorating the LPMC in a recession was a challenge, but it presented an opportunity to reach out and make a difference for members of the profession. • How do I go about forming a practice? • What can I do to brand and distinguish my firm from the competition? • How do I generate business? • What leadership skills would help me move my firm forward? • Are there web-based legal research tools that won’t cost me a fortune? • Where should I bank? • How do I get a website off the ground? • What should I do to manage my bookkeeping, and track my costs? • How do I find an office location and lease that suit my needs? • Should I use social media and if so, how? • Is there a way to use technology to streamline my operations? • How do I manage employees without a human resources director? Once we knew the questions we wanted to address, we set up one program per month through to the end of the year, and locked speakers in place to provide our colleagues with answers. In our August 2010 meeting, May Mon Post, Harper Dimmerman, and I provided tips on how to start a solo or small practice and thrive. We engaged in a roundtable, interactive discussion providing lessons we learned from running our firms. We covered everything from cost-cutting to bill tracking to marketing. We told folks how to jump through the hoops necessary to start a practice and come out ahead of the curve. You can read more about our programs in our Bar Reporter article on the subject, Also check out our Webinars and Events page, where we describe our additional Bar Association related community engagements. I serve as a Diversity Fellow in the American Bar Association.